Any prolonged dry spell begs for delivery but for British Columbians, enduring the worst wildfire season on record, rain is our reprieve. While that little sprinkle barely kissed the parched land, it temporarily cleansed smoky skies and that did a lot to lighten moods. We know our bodies don’t like smoke. The mixture of gases and small particles cause inflammation, wreaking havoc for those with chronic conditions like asthma, heart disease and diabetes, according to the BC Center for Disease Control. Advised to limit time outside and certainly to avoid exertion outdoors, many people have spent more time inside than they’d like. “Not fair!” we’ve cried. Intermittingly shrouded in a hazy layer of smoke, we’ve coughed and wheezed our way through weeks of what ought to have been clear, sunny times. “It’s so depressing!” many have muttered. “Positively post-apocalyptic!” the more dramatic say. “This smoke makes me feel so lethargic,” others complain. Much of the province has shared our pain, but for Okanaganites who consider this place the California of the North, being banned from our beaches, first by floods, and then poor air quality, has been a bitter pill to swallow with our valley vino. It’s mid August and back to school ads are in full swing reminding us September is just a whisper away and we want our summer, dammit. “It’s like we’ve been ripped off,” a friend recently exclaimed. 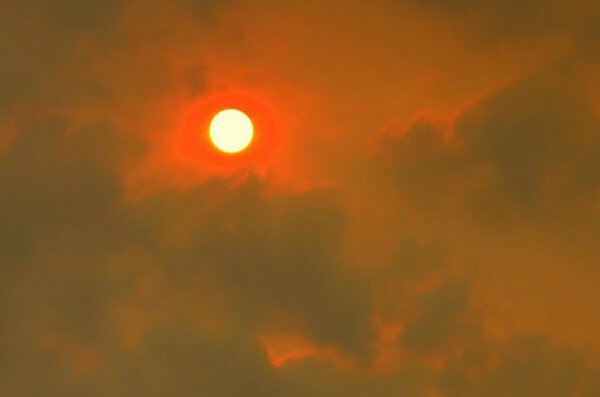 A little precipitation and cooler temperatures have done much to relieve the lungs of the oxygen deprived and make way for happier hearts, but experts say the smoke might be back, and registered Kelowna psychologist, Dr. Kathy Keating, wants us to be ready. And that’s not good because November and February are Keating’s busiest months. “In November, the dreary weather just gets going. By February, we’ve had enough already. Some of us can prepare for it, but this is different. We don’t expect it this time of year. While the climate-induced blues might seem like SAD— seasonal affective disorder — Keating says there is a difference. While most of us are bummed by the bad air quality, those with current or previous mental health issues, particularly SAD or depression, are more vulnerable to a decline in mood. Starting with the social aspect. Getting out and seeing friends is part of self-care and the smoky skies make it hard when we feel trapped indoors. Most of all, Keating says limiting physical activity is a danger zone brought on by darker skies. A mountain biker, Keating says even if she was tempted to brave the smoke, a lot of the parks and trails have been shut down due to fire risk, making it even harder for people to pursue hiking, biking, swimming, not to mention interacting with others. “Maybe your dog walking group meets weekly and it’s been cancelled or like me, group mountain bike rides have been cancelled…we could be missing out on social connection and fitness,” she warns. That’s why it’s so important to stay connected, either electronically, or by going to a movie, restaurant, even the mall — somewhere with filtered air so you’re not exposed to the smoke. General self-care is key to a healthy mind. “I always tell people if your sleep is off; if your diet is off; if your exercise is off — everything else is going to seem a lot more challenging…no one wants to go to the gym in the summer in the Okanagan, but it’s necessary for our mental health,” Keating says. Hopefully, when this column runs, the skies will be clear, but if not, think of those who have fled the very fires that are contributing to our summertime sadness, those who have endured the hellish nightmare of running for their lives, even losing their homes. Let’s keep it in perspective and hope Mother Nature smiles upon us soon. Rub-a-dub-dub, where the heck is my bathtub?